Help Durant, Oklahoma win a $500,000 Makeover on Season 4 of the Hulu show, The Small Business Revolution. Hosted by Amanda Brinkman of Deluxe Corporation and Ty Pennington of HGTV fame, one lucky small town will be selected each season to receive a Main Street makeover. Durant is the only town in Oklahoma that has made it to the final ten towns in the competition. The 5 finalists will be announced Tuesday, February 12 and online voting will begin immediately; the winner will be determined by the public through popular vote. We need your help! Should Durant be selected in the Top 5, online voting can begin IMMEDIATELY from Feb. 12 - 19 at www.mydurant.com/vote . You can vote once per day per email address, however, if you have multiple email addresses, you CAN use a different device or browser to vote again the same day with another email address. For example, if you own four devices, you need four unique email addresses to vote four times per day --- Stay tuned to Facebook for tips to maximize your votes! The final winning town will be determined by the public through popular vote, so leave no phone, tablet, laptop, or desktop unused! Anyone from anywhere nationwide can vote, so help us spread the word to your school districts, employees, employers, friends, family and everyone! A #MyDurant volunteer meeting will be held on Thursday, February 7 at 7:30 p.m. at Durant City Hall Council Chambers (300 W Evergreen). Volunteers are needed to help prepare and implement the voting strategy to win Season 4 by popular vote! We are optimistically planning to be named in the Top 5 next week and want to be prepared! 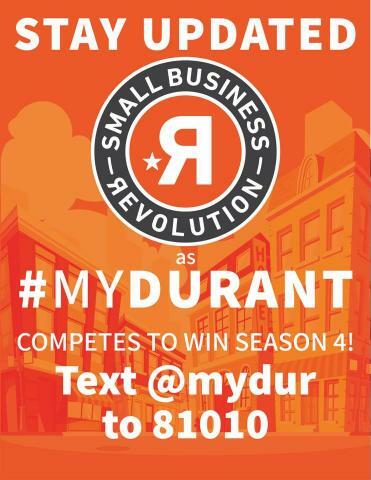 Text @mydur to 81010 to sign up for a daily text reminder to vote for #MyDurant!